Trowbridge had to make some enforced team changes following the midweek injury to Waleed Bakali and the unavailability of Mike Little. However, they proved that they have strength in depth by gaining the point they needed at Stratton to keep them on target for the championship. Gordon Saunderson was also not 100% fit so he remained on the bench and Trowbridge lined up with Daniel Barnes, Lee Wilson and Luke Smith at the back and Adam Shackell in place of Bakali. In the first half they had the slope of the pitch and the wind at their backs and claimed an early lead after just five minutes. Shackell won possession by shear determination and when the ball was played over the Stratton defence, Simon Kitchen ran through to flick the ball nicely over the advancing keeper and into the net. Stratton fought back strongly and forced two corners, one of which produced the equaliser. In the 20th minute, Kevin Coles found some space by the right post and headed home from close range. Five minutes later, the home side took the lead, Mike Solan also finishing from close range following a cross from the left wing. 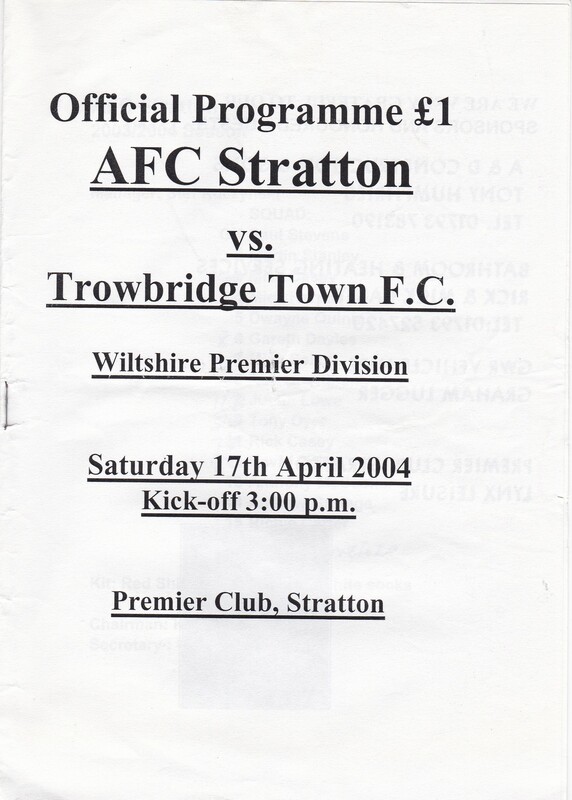 In between the two goals, Stratton nearly gifted a second to Trowbridge when an Andy Bloodworth free kick was headed powerfully towards his own goal by a defender but a brilliant reflex save by Paul Stevens prevented any embarrassment. Just before the half time whistle, Daniel Barnes headed wide and Trowbridge knew they were in for a tough second half where they would be against the wind and the slope in the second half. The bounce of the pitch and the wind made it difficult to play good football but Trowbridge seemed to equip themselves better in the second half particularly in midfield, whilst Stratton sat back and tried to catch Trowbridge on the break with long clearances in the wind. With nothing to lose Neil Kirkpatrick brought on Saunderson to play a much more forward role than usual and this paid dividends. First he was on the end of a corner to head just over and then with time running out Trowbridge were awarded a free kick. Andy Bloodworth floated the ball into a crowded area and Saunderson made no mistake when the ball fell to his feet. There was still time for Stratton to shoot wide from a free kick and for the dependable Adam Sheppard to catch a corner before the final whistle was blown. Assuming Stratton win their remaining fixtures, Trowbridge need just 10 points from six matches to claim the Premier Division title.